Forget ITCOTKC ... this is where 'prog' begins. 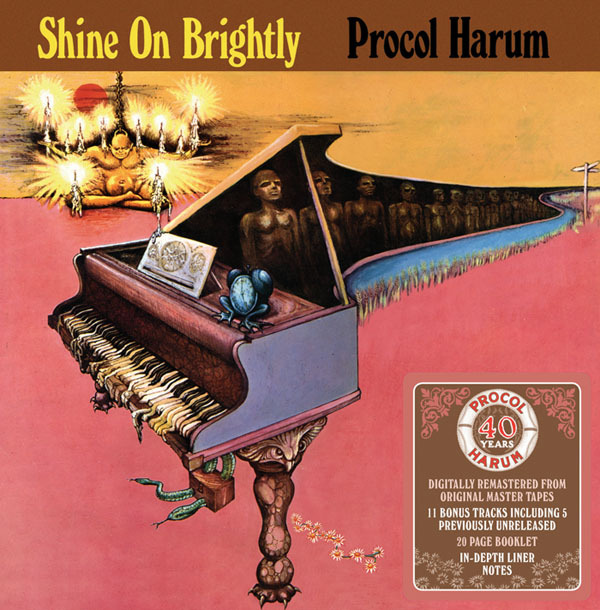 The second album from Procol Harum features the original prog epic and dare I say was more influential to future prog than the first Crimson album was. You can hear the influence of Shine On Brightly on King Crimson, Genesis and even Van Der Graaf Generator. The lyrics, singing and the twin keyboard work get all the attention, but the drumming should get a special mention. BJ Wilson was considered one of the best rock drummers in the UK; he even declined an offer to join the future Led Zeppelin. His style is a cross between that of Keith Moon and Michael Giles on ITCOTKC. When this album was added to PA someone forgot to list Wilson as one of the members. Shame! With the exception of one song, all these tracks are fairly proggy sounding ...especially for 1968. Quite Rightly So fades in with organ. This song reminds me of Traffic somewhat. Good piano work and the vocal delivery is memorable. Classical styled organ solo. Good guitar here as well. The title track is great symphonic rock. I think this was released as a single [?] but I'm not sure. Love the organ solo. Skip Softly (My Moonbeams) is a very proggy and experimental song for 1968. This sounds ahead of it's [sic] time. It starts off as almost a dark sounding children's song then changes to more symphonic rock with descending chords. Just organ and piano for awhile. Guitar and drums join in and the band goes into an evil sounding groove with a guitar solo. Later you hear an 'Oy!' and the band goes into circus-rock. Wish Me Well sticks out like a sore thumb here. A bluesy soulful rocker. Not a bad song but not even proto-proggy. Rambling On is more typical Procol with the importance on the piano and vocals/lyrics. Gets very symphonic in the middle; almost Genesis sounding! Song fades out then fades back in. Magdalene (My Regal Zonophone) has military style drumming, piano and organ at first but later acoustic guitar as well. The drumming gets faded out and then the main melody is performed on ...??? I'm not sure what, sounds like processed tubas. Along with that you get overdubbed vocals. Now, the heart of the whole album. In Held 'Twas In I is the very first side-long prog epic. It was a major influence on future prog epics, the most notable of them being Supper's Ready and A Plague of Lighthouse Keepers (which itself was an influence on Supper's Ready). Originally this epic was supposed to be a parody of psychedelic excess, the same way Thick As A Brick was supposed to be a parody of concept albums. In both cases, the joke went over people's heads but they enjoyed the music anyway. It begins with a humourous [sic] spoken word section (think a parody of the Moodies narration!) over top of an organ drone and some sitar. Goes into a rockin' symphonic part until piano and sitar play a melody. Then you hear choir-like vocals. Over the piano another spoken word part by a different voice. Then the track goes into circus music with singing. After some effects goes into a mix of folk, pop and symphonic rock. Great organ playing here. You hear more sound effects, including backwards ones. Afterwards a sinister guitar riff and eerie organ, and then a 2-note bass line takes the band to an increased tempo. The guitar plays a melody as the drumming and organ work gets more interesting. Later singing over piano, organ and harpsichord. After a drum roll the full band backs singer Gary Broker [sic]. Some melodramatic singing in spots. A great guitar solo follows. The music stops around 14 minutes. The final section of the epic begins with an almost walking bassline and melodic piano. The choir vocals come back. Another guitar solo. A very bombastic and symphonic ending (think a less weird Atom Heart Mother). Rock music rarely sounded so, uh, epic in 1968! Between the singing and keyboard work of Brooker, the drumming of Wilson, the guitar work of Robin Trower, the keyboard work of Matthew Fisher and the lyrics of Keith Reid, you have here one hell of an album. Oh yeah, there is a bass player too. Classic proto-symphonic prog. 4 stars.